It was the first of April and they arrived in boxes with pin holes on top to let air in for the baby turkeys.Their were 1200 of them and they had just hatched out of the egg the day before now having completed a days' trip by truck from the Hatchery in Zanesville, Ohio. Mom had the pens prepared and ready for the little ones. The floor was covered with a straw like material called Stays Dry. In the middle was a small coal fed stove to keep the area warm. Small dishes with ground grain feed were carefully positioned in the pen area as well as water dishes. Interestingly, colorful marbles were placed in the dishes so the turkeys would pick at them, get food or water on their mouth and learn to eat. Thus began an annual process of raising turkeys which would provide Thanksgiving and Christmas dinner for the residents of Middletown, Pennsylvania and surrounding communities. The water pipes to the chicken houses were buried under the ground about 14" deep. Normal winter weather left the pipes undisturbed. However, there were some winters where the low temperatures prevailed and the ground froze deep and yes, below the 14' depth. I recall one time when not only did the pipes freeze, but some lines broke and it was many weeks before they could be repaired. What this meant is that we had to carry water in buckets to the chickens. Sometimes the full bucket would slop over the bucket edge and the result was wet pant legs. How cold and uncomfortable it was as now even the pants froze. Water was carried twice a day and even though I was just a little guy, the entire family worked together to get it done. In Pennsylvania the snow is on the ground and it is very deep. Trudging through the hand shoveled paths one wonders if the ground will ever reappear. The barn and chicken houses seem so far away, yet they are less than one hundred yards. My memory tells me that the crisp winter air states that winter is still very much alive in this northern state. Our family was accustomed to the snow and cold, so it all seemed pretty natural, yet we longed for the sunshine of warmer weather. It is almost November in Pennsylvania and there has already been a chilling frost. The summer vegetables are all harvested and now there is not much growing. One veggie treat is found in the turnip patch. Dad always sewed the seed in early September and by now their purple tops are peeping out of the ground accented with bright green leaves. Mom was adding their special flavor to the daily cooked farm meals. But the real fun for me was a walk either going hunting or just a fall hike with a side trip through the turnips. Before leaving the house, I would pour a small amount of salt into a wax paper folded very carefully and placed in my pocket. Even in mid morning the air was quit cool and one could easily tell that winter was coming soon. Ready for a treat, I stopped to pull up just one or two turnips and using my trusty pocket knife I cut off the top and the root. Now pulling out my salt packet, I devoured the fresh raw turnip. What a tasty delight on a crisp fall hike. I note that a lot of folks are viewing my Blog. I will try to add new information as time goes on. Right now the weather in Pennsylvania is very cold. With the recent snow storm, I can picture the old farm covered with ice and snow. All too soon the ice will melt and the fields again will turn green. It is nice to know that new life on the farm will abound. 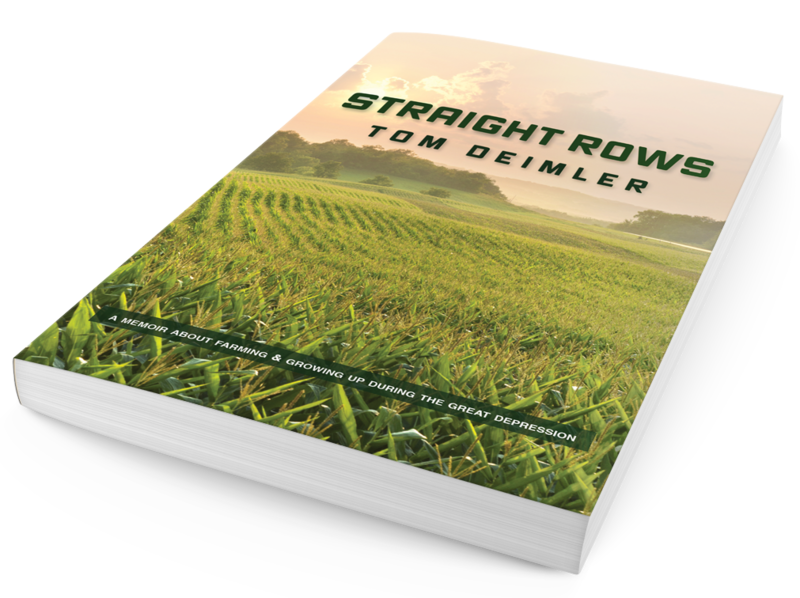 For those of you who may be interested, I am offering purchase of a "signed copy" of Straight Rows at a reduced cost of an even $12 (instead of the regular $12.95 plus postage) and in addition I will not only sign the book but I will pay the packing and pay the postage to mail it to you as well. Just access my PayPal via my eMail as follows: tomdeimler@me.com and pay the $12. I will then sign my book and mail it to you. From the end of January until the first crops of Spring, there was very little cash in our farming business. Mom and Dad would sell the last of the turkeys along about this time to a poultry butcher. The money gotten for the some 100 turkeys not sold during the recent holidays amounted to roughly a total of $300. In addition, there was a small influx of cash from the weekly sale of eggs. With expenses for the next four months, seeds and fertilizer to purchase for spring planting and other farming costs, there often was not enough funds to pay all the bills. We still had lots of canned foods, so there was plenty to eat. I recall that sometimes money had to be borrowed from a neighbor, perhaps a dairy farmer where milk provided them a year-round regular income.